It seems strange that any man should take one of the most important steps of his life, and one on which his future happiness largely depends, without duly weighing what it means beforehand. Yet, in the case of many Barristers, this is so. It would be surprising if anyone noticed him. The person who arrived on the SS Clyde on September 29, 1888, at Tilbury Station, twenty miles south of London, England, was not the ascetic, politician, and saint whose campaign for Indian independence would make his loin-clothed image instantly recognizable a century later in Richard Attenborough's Academy-award winning film, Gandhi. Rather, the figure stepping gingerly into that inhospitably cold and foggy Saturday night was a timid, even frail, eighteen-year-old child from an obscure part of a continent thousands of miles away, dispatched from his Hindu homeland to the foreign Christian and Western culture that was nineteenth-century Britain. What transformed this shy boy into a respected leader? What drew the leader to civil disobedience? The answers, in part, are to be found in the experiences Gandhi underwent in the law. Before passing into that phase of his life during which he dedicated himself to the liberation of India from British rule, Gandhi practiced law for twenty years, at first briefly and unsuccessfully in India and then for a substantial period and quite successfully in South Africa before giving up the practice and returning to India. During the period of his legal education and then his practice, Gandhi was severely tested and, in response, found his voice and his focus. He established his identity as one who saw injustice clearly and acted decisively against it, saw truth clearly and acted decisively for it. He succeeded in conjoining his practice with his beliefs, making of the law not simply his profession but his vocation. And in the end, even as he recognized the limits of traditional legal processes, he discovered the great dynamic within the law that converts civil disobedience into social change. The choice of career, like the choice of marriage, was not Gandhi's to make. Just as his marriage at age thirteen to Kasturba was arranged for him, so, too, was the decision to study law the product of family forces other than his own will. Gandhi's father, Karamchand Gandhi, had met with some success in ascending to positions of high bureaucratic power, serving as prime minister of the small dominions of Porbandar, Rajkot, and Vankaner. While Karamchand's political career failed to make his family wealthy, neither did the family want for the basics of life. Theirs was a day-to-day stability. Karamchand's health, however, worsened as a result of age and accident, and eventually he was forced to give up his career in government. When he passed away, he did not leave the family anything on which to live. None of Gandhi's three older siblings had the prospects required to carry the family. Accordingly, the burden settled on the shoulders of young Mohandas Karamchand Gandhi. After completing high school, Gandhi passed the Bombay University matriculation examination and took up his studies at Samaldas College in Bhavnagar in 1887. He wasn't much of a student, being both uninterested in and unable to follow his professors' lectures. Compounding the difficulty he had with his studies were his physical problems. Gandhi complained of constant headaches and nosebleeds due, some conjectured, to the hot climate. Gandhi's summer vacation from Samaldas could not come too soon. In late April 1888, at the start of his vacation, Gandhi and his oldest brother, Lakshmidas, decided to visit a friend of the family, the Brahmin Mavji Dave. On hearing Gandhi's complaints about college, including his prediction that he would fail his first-year examination, Mavji suggested that Gandhi be sent to England to study for the bar. This, he thought, would prepare Gandhi to reclaim his father's position and income in much better fashion than would the pursuit of an ordinary college degree. The calculus being made at this time did not involve altruistic concerns. The naked purpose of providing young Gandhi a legal education was to guarantee an income for the family. It is not surprising, then, that when Gandhi was asked in 1891 why he had come to England to study the law, his forthright reply was "ambition." There are no reports indicating just what Gandhi thought at this time of what a life in the law meant, if he gave any thought to it at all. Indeed, there are no reports indicating any resistance on Gandhi's part to the idea of training in the law, except his timid inquiry whether he could be sent to study his first love, medicine, instead of law, a proposal which was quickly discarded in the wake of his brother's declaration that it was their father's wish that Mohandas become a lawyer, not a physician. Thus it appears that Gandhi accepted the choice of profession made for him with little more objection than that he voiced to the choice of a wife his family made for him. Regardless of the little thought Gandhi himself may have given to studying the law or being a barrister, we do know that he relished the prospect of three years in England. Perhaps this is what motivated him to overcome four serious obstacles to his studying law there: the lack of any means to finance his legal education overseas, the concerns of his wife's family, the uncertainty of his mother, and the opposition of his caste. Lakshmidas assumed the task of obtaining financing. His first attempt at securing the necessary funds was to send Gandhi off to beseech Frederick Lely, the British administrator of Porbandar state, for governmental assistance. The Gandhis hoped that their reputation with Lely, established by the late Karamchand, would lead Lely to open the state coffers. After a four-day journey to Porbandar and after elaborately rehearsing his request, Gandhi was startled when his request was dismissed out-of-hand. Lely brusquely advised him to secure his B.A. before attempting the study of law, after which Lely would consider granting some aid. Gandhi then turned to his cousin Parmanandbhai, who promised his financial support, as did Meghjibhai, another cousin. Despite their promises, there is no evidence that either of these cousins aided Gandhi; indeed Meghjibhai is on record as later angrily denying Gandhi any help. Two additional governmental representatives whom Gandhi approached were as unhelpful as Lely. Other than some small amounts of money and a silver chain that some of his friends gave him on his departure from Bombay, it appears that Gandhi received no financial help from any of his friends, extended family, or governmental officials. If Gandhi was to go to London, it would be by exhausting what capital remained with his immediate family after the death of Karamchand. Money, however, was the least-complicated of Gandhi's problems. He was married to Kasturba, the daughter of the merchant Seth Gokaldas Makanji of Porbandar-an arrangement put together according to Indian custom by the families of the children. Now here was the eighteen-year-old Kasturba, pregnant with the couple's child, about to be abandoned for three years by her husband. This did not sit well with Kasturba's parents. Gandhi spent many hours convincing them of the wisdom of his intentions and reassuring them that Lakshmidas would look after Kasturba. Speaking of the difficult project of winning over Kasturba's parents to his plan, Gandhi later said, "Patience and perseverance overcome mountains." But an even more difficult task lay ahead-obtaining the blessing of Gandhi's mother, Putli Ba. Naturally, she had the reluctance any mother would to bid adieu to her youngest child. Perhaps as an expression of this fear, but more likely as an expression of genuine spiritual concern, Putli Ba, a devout Hindu, worried that her son would surrender his Hindu practices to the English appetite for the forbidden pleasures of wine and meat. Indeed, there was an idea abroad at this time in India that wine and meat were actually necessary for survival in the English climate. Determined to go to England, Gandhi devised two ways of dealing with his mother's concerns. First, by his own admission, he exaggerated the benefits of his English sojourn. Second, to quiet her concerns about his moral purity, he secured the services of Becharji Swami, a Jain monk and a family advisor, to administer an oath to him that he would refrain from wine, meat, and for good measure, women. With these steps reassuring Putli Ba, she granted her permission. Even with his immediate family in the fold, however, Gandhi's plan was controversial. To make his way to London, he needed to travel from Rajkot to Bombay, where he would board a steamer for England. Bombay was even more populated by members of his caste than his hometown. This was unfortunate for Gandhi; there was heated resistance on the part of his caste to the notion of any of their members going abroad. A series of incidents in which Gandhi was peppered with harassment on the streets of Bombay for his intentions was followed by an even more dramatic public confrontation. Gandhi was forced to attend a meeting of his entire caste, at which the subject of his going abroad would be addressed before the whole group. The discussion came to a head with this ultimatum issued by the leader of the caste to Gandhi: "We were your father's friends, and therefore we feel for you; as heads of the caste you know our power. We are positively informed that you will have to eat flesh and drink wine in England; moreover, you have to cross the waters; all this you must know is against our caste rules. Therefore, we command you to reconsider your decision, or else the heaviest punishment will be meted out to you." Gandhi's unequivocal response was to reject the threat, saying that he was going nonetheless. The head of the caste thereupon decreed that Gandhi was no longer his father's son, ordered all members of the caste to have nothing to do with him, and declared him an outcast. While the initial idea of taking up legal studies did not belong to Gandhi, it is clear from his determination to remain unaffected by the decision of his caste and to overcome the other obstacles to his going that once he embraced an arrangement thrust upon him by others, he advanced that arrangement with all the same energy and spirit of one who gave birth to it. Just as he had been faithful to his arranged marriage, he would be faithful to the plan to study the law, foreshadowing his faithfulness to the integrity of the legal process itself that would distinguish his career in the law. On September 4, 1888, two weeks after being ejected from his caste, Gandhi boarded a steamship for London. The world of legal education into which Gandhi stepped in the fall of 1888 would be almost unrecognizable to legal educators today. It is now almost universally true that there is a serious academic component in one's training for the bar, usually in a university context. It often includes or is followed by practical training in either simulated or actual practice settings or both. Legal education at the close of the nineteenth century in London could hardly have been more different. To begin with, the student prepared for the call to the bar in something other than a traditional university setting. Since at least the middle of the fourteenth century those who wished to become barristers received their call to the bar by first enrolling in one of the four Inns of Court. The source of the term "inn" is instructive. Historian Robert Pearce tells us, "The word 'Inne' was anciently used to denote the town houses in which great men resided when they were in attendance at court." From this beginning the various Inns grew into powerful voluntary associations of barristers, centered in London, the purpose of which was to control entry to the bar and to provide young men an environment within which to read the law in preparation for their bar examinations. One must be quick to add, however, that there appears to have been another function of the Inns, namely to school barristers-to-be in the long-standing elitist traditions of the bar. This tradition had deep historical roots. Sir John Fortescue, the Lancastrian chief justice, speaking of the practices of the fifteenth century, said that "the greatest nobility ... often place their children in those Inns ... not so much to make the laws their study, much less to live by the profession ... but to form their manners." This deep-rooted awareness of manners and social status persisted down to the time Gandhi began his studies and was no more evident than in the requirement that the student eat a minimum number of dinners with his fellow students and the senior barristers of his Inn while awaiting his call to the bar. Dinners were highly stylized affairs, emphasizing hierarchy, formality, and tradition. At earlier points in their history, the Inns provided the students with lengthy and careful lectures, known as readings, by distinguished members of the bar. The reader prepared an elaborate discussion of an act or statute that, after being delivered, was followed by a series of arguments by barristers about the incorrectness of the reader's opinion, followed itself by the reader's rebuttal. In addition to these readings, the students were provided with the opportunity to observe mock exercises called bolts and moots. By the time of Gandhi's arrival these practices had disappeared, and the Inns, while retaining their control over admission, had, with respect to their pedagogical function, descended to institutions akin to educationally undemanding social fraternities. The practice of "keeping terms," as the dinner requirement was known, remained, but in an eviscerated form. Four terms a year were held. A student was required to keep twelve terms in all, meaning that one could complete his preparation for the bar in just under three years. During these terms, students with university educations were required to dine at least three times during each term in a dining hall run by the Inn while nonuniversity students, like Gandhi, were required to eat dinner there at least six times a term. Students and barristers would be seated at tables of four, while the "benchers" would be seated separately. Although all were required to appear for dinner attired in their formal gowns, there was no requirement that any part of the dinner conversation center on the law. Indeed there was not even any conversation between the students and the benchers. There were no readings, lectures, or speeches. There were no moot exercises, the custom of conducting mock trials having been discarded long before Gandhi arrived. The only requirement was that the student, to get credit for attending, appear before grace was said and remain present throughout the dinner until a concluding after-dinner grace was said. By 1888, it appeared that keeping terms had lost any function it may once have had to impart a formal legal education to the students and was reduced to nothing more than a ceremony to inculcate in the student the manners of his profession. Apart from dinners there was no setting in which students were required to come in contact with either lecturers or practitioners. The students' days were their own. A diligent student would occupy himself, perhaps in one of the Inns' comfortable libraries, with the reading entailed in meeting the only academic requirements of this process: the passage of two written examinations, one in Roman law and one in English law. The Student's Guide to the Bar, by William Ball of the Inner Temple, published in 1879, states that the knowledge required to pass the Roman law examination was slight, and advises that for the person with a university education, "six weeks' work of ... six hours a day would be sufficient." In the period before Gandhi arrived in England, the English law examination had developed a reputation for being not much more challenging than that in Roman law, with Ball estimating that "four months' work of ... six hours a day ought to be amply sufficient for a University man of average abilities and education." The picture changed just before Gandhi started his studies. Writing on the eve of Gandhi's arrival in London, T.B. Napier and R.M. Stephenson, authors of A Practical Guide to the Bar (1888), claimed that "until quite recently the difficulty of the Bar examinations was greatly underrated" and that the "percentage of men who are ploughed for the Bar examinations is tolerably large." It is not surprising, then, that they advised more study than Ball, namely two to three months of steady work for the Roman law examination and more than just "a few months' reading" for the English law examination. The final condition for being called to the bar was simply that the applicant be at least twenty-one. These were the requirements to be called to the Bar in Gandhi's day, a set of criteria so minimal that it was universally agreed that one's legal education at the Inns had to be supplemented by an apprenticeship if one was to have any chance of success as a barrister. By associating himself with a practitioner, the pupil could familiarize himself with practice not only by observing the work of his barrister but by helping in the work itself, such as by drafting conveyances and pleadings under the barrister's supervision. Opinions as to how long a pupil should read in chambers, as it was called, ranged from one to three years. Like every barrister-to-be, Gandhi had his choice of inns. Of the four-Gray's Inn, Lincoln's Inn, the Middle Temple, and the Inner Temple-the Inner Temple was the most expensive. Gandhi chose the Inner Temple. Given the difficulty he had in India raising the funds to support himself in England, and given his lifelong habit of squeezing every ounce out of every rupee, a habit already well developed when he arrived in England, this is something of a surprise. Because there is no record indicating why Gandhi chose the Inner Temple, we can only speculate. Perhaps he chose it because it was the most prestigious; the Inner Temple numbers Lord Coke, for example, among its graduates. Perhaps he chose it because it had the largest membership and because he thought he could therefore expect to find there the company of a fair number of countrymen. The most plausible explanation, however, is that he chose it because it focused on the common law, the study of which would aid him later in his practice in India. Whatever Gandhi's reason for choosing the Inner Temple, it was not unlike the other Inns with respect to the abysmal level of training it offered aspiring barristers. By the middle of the nineteenth century, the Inns had fallen to a very low point. Only the most minimal intellectual standards were maintained. It was not until the decade before Gandhi's arrival, in 1872, that the Inns agreed to require students to take a bar examination, and it was not until the very year Gandhi arrived in England that all the Inns required that nonmatriculates take and pass a special entrance examination. Since Gandhi had already passed the Bombay matriculation examination, he was excused from the preliminary examination to which nonmatriculates were subject. Gandhi's agenda, therefore, was clear and simple: to be called to the bar, he had only to keep terms and pass examinations in Roman and English law. But Gandhi was still a student without a university degree, while the great majority of his fellow students were university graduates. To make matters worse, Gandhi didn't even have full command of the English language. When he was unceremoniously invited to leave a swank restaurant because of what were perceived to be his bad manners, he assuaged his pain by resolving to take on Western ways and master "the task of becoming an English gentleman." As part of his plan to become more sophisticated, Gandhi began searching for a suitable program of study. The reputation of the special admission examination for nonmatriculates was that it was a pushover, requiring only minimal knowledge of Latin, English, and English history. Gandhi needed something quite different to distinguish himself. In the University of London matriculation examination he found a suitably difficult challenge. In addition to the subjects tested on the bar's special examination, this examination required that the student know other subjects, including science and a modern language. Gandhi chose to be tested in French, a language with which he had some familiarity. Joining a private matriculation class and keeping meticulous fidelity to a self-imposed schedule, Gandhi undertook a five-month course of fairly arduous private study that culminated in his taking the examination in January 1890, nearly a year and a half after landing on England's shores. The results were not good. Gandhi, to use his phrase, got "ploughed in Latin." Latin and French together, he later admitted, were too much for him. Gandhi was unbowed. He renewed his studies, substituting "heat and light" for the more difficult subject of chemistry, and reattacking Latin, for which, he says, he acquired a taste. At the same time, Gandhi apparently was suffering from pangs of guilt, thinking that he was spending his family's fortune only to meet failure. Accordingly, he secured a smaller apartment and began eating more of his meals at home. The change, he says, "harmonized my inner and outer life. It was also more in keeping with the means of my family. My life was certainly more truthful and my soul knew no bounds of joy." Gandhi took the examination in June 1890 and, this time, passed it. Making his accomplishment all the more noteworthy is the fact that for much of the time prior to his taking the London examination, he was also preparing for his examination in Roman law, which he took just three months earlier. Those in the business of advising law students at the time universally recommended that the Roman law examination be taken at the earliest possible moment, thus freeing up the maximum amount of time to study for the examination in English law that followed. Inns permitted their students to take the Roman law examination after four terms. Gandhi would have completed his first four terms with the end of the Trinity term in mid-June 1889, yet he did not take the Roman law examination until March 1890. Why the delay? The most likely explanation is that Gandhi divided his attention for a substantial period of time between his preparation for the Roman law and London examinations. Whatever the reason for the delay in taking the Roman law examination, Gandhi was not hurt by it. He finished sixth out of the forty-six who sat for it. Not a bad showing for one who was not a "University man." With the Roman law and London examinations both behind him, Gandhi opened the summer of 1890 with but one more substantial hurdle: passage of the English law examination (known as the "bar finals"). This examination could not be taken before one had kept nine terms. For Gandhi, his ninth term would be completed with the conclusion of the 1890 Michaelmas term on November 25, 1890. For this examination, Gandhi was out of the gate with the crack of the starter's gun, sitting for it at the first opportunity, from December 15 to December 20, 1890. While this set of dates falls just six months after his London examination, Gandhi actually spent more time than that to prepare, pouring himself into the common law for "nine months of fairly hard labor." Even accounting for a month he spent in Brighton in the summer of 1890 and accounting for the study he undertook earlier in 1890 to pass the Roman law and London examinations, the amount of study Gandhi invested in preparation for the bar finals exceeded the four months of study recommended by Ball for a university-educated person. In his autobiography, Gandhi recounts that he managed to increase his burden of preparation by forgoing the use of notes on the law that were circulating among students, choosing instead to go directly to the recommended textbooks instead. Foreshadowing the scrupulousness that would characterize his entire life at the bar, he felt that to do otherwise would be a fraud. Accordingly, he purchased and read "all the text-books ... , investing much money in them." Among the treatises Gandhi read were Snell's The Principles of Equity, Intended for the Use of Students and the Profession, which he found "full of interest, but a bit hard to understand" and which actually would aid him in his religious explorations later in life, and Williams' Principles of the Law of Real Property, Intended as a First Book for the Use of Students in Conveyancing, surely the only law text in existence ever described as reading "like a novel." Gandhi's industriousness paid dividends. On January 12, 1891, he learned that he had passed his bar finals. Validating Napier and Stephenson's observation that the test had recently become more difficult than most thought, 32 of the 109 test takers failed. Of the 77 who passed, Gandhi placed in the top half, finishing 34th. Gandhi placed fairly highly, too, in the esteem of his fellow "dinner barristers," as they were then called, but not for very admirable reasons. Each table of four was allocated a set amount of wine for each meal. With the abstemious Gandhi at one's table, the wine could be split not four ways, but three. As a result, Gandhi was very much in demand as a dinner companion. And dinner was his last formal obligation, for with his passing the bar finals, Gandhi had now fulfilled all the academic requirements for the call to the bar. But for the necessity of keeping the Hilary, Easter, and Trinity terms, he had no obligations between the end of his test on December 20, 1890, and the date in early June 1891 when he could anticipate being called to the bar. While an apprenticeship was not a requirement for being called, students were nonetheless strongly advised to use the half-year between the bar finals and the call, as well as a period of one to two years after the call, to learn how to practice by serving as apprentices in the offices of practicing barristers. Without the experience of pupilage, it was adjudged that the "greatest amount of theoretical or book knowledge [was] comparatively worthless." For reasons he does not explain, and apparently contrary to the general advice he later gave others, Gandhi never apprenticed. Why forgo the experience? Perhaps Gandhi deemed practice in India so different from that in England that apprenticing would have been a waste of his time-an unlikely supposition in light of the court system operated by the British Empire in India. Perhaps the fastidiously economical Gandhi did not believe he could afford to apprentice; after all, it was not free. A pupil was expected to pay his barrister fifty guineas for each six months of pupilage. Perhaps Gandhi could not find a barrister who would take him on for such a relatively short period of time with no prospect of Gandhi's returning the investment with permanent employment. Perhaps Gandhi, lacking close connections to the British bar, could find no barrister at all. The most intriguing explanation, however, is that Gandhi was preoccupied with a realm of life entirely separate from the bar. When he arrived in London, Gandhi was thrust into a world where he was a stranger looking to be accepted. The world of the Inns, with its dinners, costumes, formality, and long tradition of catering to the educated, wealthy, and noble, was an upper-class world to which this relatively uneducated boy from the colonial backwaters of India was unaccustomed, but which he was eager to explore. Gandhi's understanding of the privileged status to which barristers were entitled may have led him to see his mission in England to learn and take on the customs of the elite. After all, he had been sent to England to attain the lofty status of barrister for one reason only: to come home and provide financial leadership for the family. Thus, it is likely that Gandhi believed that becoming a barrister required of him different tastes and manners. Accordingly, he experimented in 1890 with top hats, starched collars, silk shirts, striped trousers, gold watch chains, leather gloves, walking sticks, patent leather shoes, spats, and evening suits. The private lessons in dance, elocution, violin, and French that he took for a brief time can be similarly explained. With time, however, Gandhi came to his senses, realizing that a dandy was not who he was, nor who he needed to be, in order to be called to the bar and to practice in India. Here his pledge to his mother to avoid wine, meat, and women might have fortified him with the beginnings of the independence he needed to escape the full grasp of British upper-class mores. Yet the attraction of belonging to a privileged group gripped him still. It was in his study of theosophy and his embrace of the cause of vegetarianism that he discovered a way to bridge the distance between faithfulness to himself and things Indian, on the one hand, and, on the other, his attraction to the higher strata of British society where, at least at the edges, theosophy and vegetarianism were thriving. Theosophy in Gandhi's time was a religious philosophy with roots in the teachings of the Russian-born medium Helena Petrovna Blavatsky. She, along with an American, Henry Olcott, founded the Theosophical Society in New York in 1875. Theosophy argued that all religious traditions "hold in common many religious, ethical, and philosophical ideas." It purported to explain the commonality of all religious thought by resort to the notion that an ancient band of "great spiritual Teachers (themselves the outcome of past cycles of evolution) acted as the instructors and guides of the child humanity of our planet, interpreting to its races and nations the fundamental truths of religion in the form most adapted to the idiosyncrasies of the recipients." The truth that they passed on to Blavatsky and her followers was divine wisdom, the Greek for which (theos and sophia) gave rise to the name of this body of thought. The openness of theosophy to all the great religious traditions included an embrace of Hindu ideas, which in turn led theosophy to a pantheistic understanding of God, an emphasis on the oneness of all people, and a belief in human perfectibility. One could see how readily each of these notions might appeal to a young Hindu stranded in an alien culture far from home. Gandhi tells us he was introduced to theosophy by two friends who asked him for help in reading Sir Edwin Arnold's The Song Celestial, a poetic translation of the Bhagavad Gita. The friends thereafter took him to Theosophical Society meetings and eventually to a talk given by Annie Besant, a follower of Blavatsky and a leading theosophical theorist of her time, whose speeches emphasized brotherhood, tolerance, and the spiritual nature of people. The talk Besant delivered the night Gandhi was in the audience defended theosophy against its critics, causing Gandhi to later write: "The words she uttered ... as she rose to answer the charge of inconsistency have never faded from my memory. She said as she wound up her great speech that she would be quite satisfied to have the epitaph written on her tomb that she had lived for truth and she died for truth. "Gandhi made it a point to read Blavatsky's The Key to Theosophy. The effect of this reading was to stimulate in him "the desire to read books on Hinduism" and to disabuse him "of the notion fostered by the missionaries that Hinduism was rife with superstition." Despite this interest, Gandhi felt that he did not have sufficient time to continue his religious explorations while examinations were looming. Thus, it appears that the period of Gandhi's most intense involvement with theosophy came to an end sometime before December 15, 1890. And when his examinations concluded on the 20th of December 1890, it was not theosophy that reclaimed his attention, but vegetarianism. Gandhi's initial interest in vegetarianism resulted from a blend of pragmatism and principle. To secure her blessing for the trip, he had promised his mother he would not touch meat. Keeping this pledge caused him to endure a fairly lengthy trial, stretching from the time he boarded the SS Clyde in early September to late October 1888, during which time he ate meals that were meatless but nutritionally inadequate for this eighteen-year-old man-child. On the Clyde, an English fellow passenger importuned him to eat meat, claiming that it was "so cold in England that one cannot possibly live there without meat." Gandhi politely turned away the advice, saying that if what the passenger was saying were true, he would simply pack up his bags and return to India before violating his vow. Gandhi's fidelity to his pledge (as well as his fear of having to speak English) resulted for some days in his eating spartan meals in his cabin, meals consisting of nothing more than sweets and fruits brought from home, before other arrangements could be made. After finding his initial lodging in England at the Victoria Hotel, Gandhi apparently had little luck there, reporting that he paid the princely sum of £3 for his short stay and got very little to eat for it. He was forced to continue eating from his store of Indian sweets and fruits. Even after Gandhi left the hotel and secured private, less expensive rooms, he found that all the meatless dishes put in front of him were "tasteless and insipid." This, plus a serious case of homesickness, left this young man lying in bed at night, wondering whether he had erred in leaving home, pining over the loss of his mother's affections, and unable to check the rivers of tears flowing down his cheeks. Gandhi had come to England with several letters of introduction, including one addressed to Dr. Pranjivan Mehta, a medical doctor as well as a barrister-in-training himself, who hailed from near Gandhi's hometown. Mehta quickly recognized Gandhi's need for some social context, for he convinced him to move and take on a roommate, all in preparation for eventually taking quarters with an English family. Mehta's argument was that Gandhi, after all, had come to England not so much to get an education as to gain "experience in English life and customs," something life with a family would provide. Gandhi soon thereafter moved in with Dalpatram Shukla, another law student from Gandhi's region. It became Shukla's job to train the young Gandhi in English ways-in the course of which he could not get Gandhi to eat meat. Despite his profound dislike for the landlady's nonmeat dishes, Gandhi resisted sampling her meat dishes. Seeing Gandhi's resistance, Shukla lost his temper and exploded: "Had you been my own brother, I would have sent you packing. What is the value of a vow made before an illiterate mother, and in ignorance of the conditions here?" Gandhi, however, remained steadfast-and hungry. After a month of training in English ways, save meat eating, Mehta and Shukla found a family in West Kensington willing to board Gandhi. Again, he found the meals insipid and complains in his autobiography that he continued to "practically ... starve." But eventually the day came when his landlady informed him that there were vegetarian restaurants in London. Gandhi seized on this information and found, to his great happiness, the Central Restaurant off London's Farringdon Street. He related later that the very sight of the restaurant filled him with joy. From the date of reading this book, I may claim to have become a vegetarian by choice. ... I had all along abstained from meat in the interest of truth and of the vow I had taken, but had wished at the same time that every Indian should be a meat-eater, and had looked forward to being one myself someday, and to enlisting others in the cause. The choice was now made in favour of vegetarianism, the spread of which henceforward became my mission. His "appetite for dietetic studies" whetted by Salt, Gandhi "went in for all books available on vegetarianism." Eventually Gandhi found new rooms (he was constantly moving during his London student days) in order that he might economize by cooking for himself. By mid-1890 Gandhi was able to report that he "enjoyed the best of health and had to work very hard if not the hardest as there were only five months left for the final examination." During this pre-exam period Gandhi was invited by Josiah Oldfield, a leading vegetarian whose acquaintance Gandhi had made earlier, to a vegetarian conference to be held in September 1890. As a result of his participation in this conference, Gandhi was almost immediately invited to become a member of the Executive Committee of the London Vegetarian Society (LVS), an invitation he accepted. With exams looming, however, Gandhi appears not to have taken much of a role on the committee. After the completion of his final examinations, by contrast, Gandhi was a beehive of vegetarian activity. Giving a preview of the prodigious output of writing for which he would later become known, Gandhi produced a series of articles for The Vegetarian, the weekly journal of the LVS. First he wrote a series of six essays on the practice of vegetarianism in India. This series was followed by a series of three articles on the festivals of India. Gandhi then delivered a speech titled "The Foods of India" before the LVS and had it printed thereafter in the Vegetarian Messenger, the society's Manchester voice. Gandhi also gave a two-part interview to The Vegetarian. In addition, he found time to get embroiled in the inner politics of the LVS, to start up a local vegetarian club with his friend and eventual roommate Josiah Oldfield, and to make appearances in a number of forums on behalf of vegetarianism. This intense round of activity closed out Gandhi's time as a student in London. In the months since his bar finals, while his fellow students were learning to draft conveyances and pleadings in chambers, Gandhi's involvement with the vegetarian movement was schooling him in ways of "organizing and conducting institutions." He also was learning something about himself with no little import for a young barrister's future, a lesson with ominous implications for the career that his family had chosen for him. He was terrified, sometimes to the point of paralysis, of speaking in public. In 1888, at the age of eighteen, Mohandas Gandhi sets out from his modest home in India. Shy, timid, and soft-spoken, he embarks on what he believes will be a new life abroad. Twenty-seven years later, at the age of forty-five, he returns—this time fearless, impassioned, and ready to lead his country to freedom. 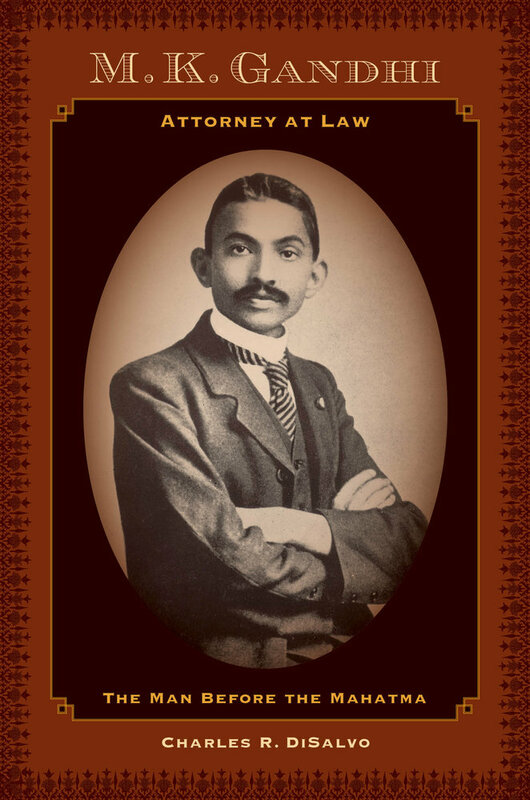 M. K. Gandhi, Attorney at Law is the first biography of the Mahatma’s early years as a lawyer. It follows Gandhi as he embarks on a personal journey of self-discovery: from his education in Britain, through the failure of his first law practice in India, to his eventual migration to South Africa. Though he found initial success representing wealthy Indian merchants, events on the ground would come to change him. Relentless attacks by the white colonial establishment on Indian civil rights prompted Gandhi to give up his lucrative business in favor of representing the oppressed in court. Gandhi had originally hoped that the South African legal system could be relied upon for justice. But when the courts failed to respond, he had no choice but to shift tactics, developing what would ultimately become his lasting legacy—the philosophy and practice of nonviolent civil disobedience. As he took on the most powerful governmental, economic, and political forces of his day, Gandhi transformed himself from a modest civil rights lawyer into a tireless freedom fighter. Relying on never-before-seen archival materials, this book provides the reader with a front-row seat to the dramatic events that would alter Gandhi—and history—forever. Charles R. DiSalvo is the Woodrow A. Potesta Professor of Law at West Virginia University where he teaches one of the few law school courses on civil disobedience in the United States. He has also represented civil disobedients in trial and appellate courts, written widely on civil disobedience, and lectured on the subject in the United States and abroad. He is the co-founder of the West Virginia Fund for Law in the Public Interest.